The RN had been asking for a dive bombing sight since the early 1930s, but it never became a reality. The RAF was largely indifferent to dive bombing, and, as it controlled naval aircraft development until 1937, held back the RN's ability to develop a true dive bomber. Finally, with specification O.27/34, the RN was allowed to have its way. On December 12,1934, the Air Ministry invited Vickers and Blackburn to submit designs for an Osprey replacement. Two months later Blackburn tendered the B-24, an all-metal low-wing monoplane. Vickers submitted its Type 280, a midwing monoplane with semielliptical wings, powered by a Rolls-Royce Merlin. The Blackburn design, with its retractable undercarriage and flaps , was the most modern submission. Blackburn was awarded a contract for two prototypes, but the B-24 had still not flown by October 1936. On the 24th the Air Ministry confirmed a production contract for 150 B-24s, later increasing it to 190. 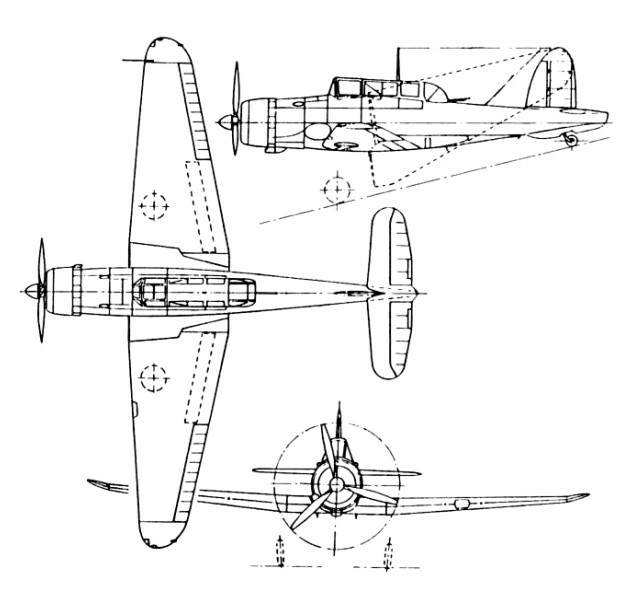 Blackburn apparently saw the design as a dive bomber above all else, designating the project the DB-1. The Air Ministry stipulated a number of production requirements. The Bristol Mercury radial engine was replaced by a nine cylinder Perseus PRE3M, Bristol's first production sleeve-valve engine; relatively untried for an aircraft already suffering delays. Armament was to be four Browning 0.303in machine-guns in the wings, with 600 rounds per gun, and a Lewis Mk III machine-gun in the rear cockpit. The main bomb proposed was a 250pounder, though later the Air Ministry asked that a 500lb semi-armour-piercing (SAP) bomb be carried. It was also requested that the aircraft be readily convertible for target towing. Both the Skua and the Roc were of all-metal stressed-skin construction, with external plating flush-riveted to longitudinal stringers over transverse frames. The fuselage was built in two sections. The main fuselage ran from the firewall at the nose to a point just ahead of the fin, while the detachable rear fuselage incorporated the fin and tailplane mountings. The fuselage had a hollow in the upper surface containing a liferaft, and the cover was faired in with the top of the rear fuselage. The raft was accessed by pulling a D-ring on a cord in the rear cockpit, which rarely worked as advertised. Along most of its length the fuselage was of circular section, but under and immediately aft of the wings triangular-section fillets joined the mainplanes to the fuselage, giving a complex cross-section. Two watertight compartments were built in. The cockpit was watertight up to the coaming and was enclosed by a long framed glazing with a steep windscreen. Two of the fuselage frames in the cockpit area extended to the top of the cockpit to prevent crushing if the aircraft overturned. The glass was unarmoured initially, although from July 1940 armoured glass was added to the windscreen front panel. The standard RAF blind-flying panel formed the centre of the instrument panel; the gunsight was a Mk II reflector unit. Two 200gal non-self-sealing fuel tanks were installed in the middle of the cockpit on either side, while a small tank for starting the engine was mounted in the forward fuselage. The rear gun was mounted on a Fairey pillar, and lowered into a recess in the rear fuselage when not in use. The glazing enclosing the rear cockpit could be swivelled back into the canopy when the gun was to be used. Rather than a seat, the Observer or Telegraphist Air Gunner(TAG) had only a thinly rubber-padded bench atop the bomb recess. To keep the TAG in place during diving and other violent manoeuvres a "g-string" was bolted to the floor, and the occupant could attach this to his harness. A bar could also be attached across the rear cockpit to give added support. The production Skua II and Roc I had a cartridge-started Bristol Perseus XII nine-cylincler sleeve valve moderately-supercharged air-cooled radial engine giving 745 b.h.p. maximum climbing for 30min and 905 b.h.p. in level flight for 5min. Cooling gills at the rear of the cowling could be opened to provide greater flow of air. The engine was mounted on a two-bay tubular steel structure and fully cowled. An exhaust collector ring fed into a single tube discharging to starboard. The three-bladed, two-pitch de Havilland propeller was hydraulically operated. The wings comprised three main sections; a centre section and two outer panels. The outer panels could be manually folded back along the fuselage for stowage of the aircraft in carrier hangars. The wings were based on two box-girder spars, on to which were attached the latch pin fittings that locked the wings in place when unfolded. The ailerons were fabric-covered. The all-metal flaps, of aerofoil section, were operated by hydraulic jack rams. The flap was arranged so that the leading edge moved aft as the flap was extended. At full extent the flap was vertical and the leading edge had moved through approximately 16 of the chord of the flap. The tailplane was a two-spar structure similar to the wings, with a fabric-covered mass balanced elevator. The fin, which was detachable, was set forward of the tailplane to avoid the airflow being blanketed in a spin and at low speeds. The rudder was fabric-covered and horn balanced. Trim tabs on elevators and rudder could be controlled from the cockpit. The undercarriage consisted of two retractable main units and a non-retractable tailwheel. The main units were oleo-pneumatic struts mounted on the outer edges of the centre section. The undercarriage legs and all the hydraulic retraction gear were located in the centre section, but folded outwards into the outer mainplanes. The tailwheel was fixed and later modified with an anti-shimmy device that could lock it straight or leave it free. The Skua and Roc were equipped with an RT1110 Wireless Telegraphy (W/T) set consisting of a 1082 Receiver and a 1083 Transmitter. The W/T used an overhead aerial, but to make best use of the high-frequency equipment a trailing aerial could be wound out by the TAG or Observer. Communication was only by Morse code, but the transmitter was also used as an amplifier to provide intercom between the front and rear cockpit, a vast improvement on the Gosport tubes of previous FAA aircraft. Communication between aircraft in flight was basic or non-existent. The W/T set was tuned laboriously by fitting pairs of plugs (twenty pairs, one red plug and one green) into sockets, more or less by trial and error until the correct coil for a particular frequency was reached. In the Skua this equipment was situated at the rear of the cockpit; in the Roc it was repositioned in the central space between the turret and the pilot's cockpit. The Skua's wings contained two Browning 0.303in No 4 Mk II machine-guns in each mainplane, with 600 rounds for each. The guns were controlled by armoured compressed-air lines. Access to the guns and ammunition was by removable panels in the upper and lower wing surfaces. The TAG or Observer was armed with a single 0.303in machine-gun. The Lewis Mk IIIEwas specified, but a number of Skuas were armed with Vickers K gas-operated machine-guns. Offensive weaponry on the Skua consisted of a main bomb carried centrally under the fuselage and up to eight smaller bombs carried under the wings. The central bomb rack was fitted in the centre section, buried within the fuselage. A faired recess in the centre section allowed the bomb to be carried with around 2A of its depth within the fuselage, reducing drag. An ejector arm pivoting just aft of the wing leading edge swung the bomb clear of the propeller arc and was returned by springs once the bomb was released. The Skua could carry the 5001b or 2501b semi-armour-piercing (SAP) bomb, the 2501b general purpose (GP) bomb or the 100lb anti-submarine (AS) bomb. Two Light Series bomb racks could also be fitted, one under each of the mainplanes. Each could carry two 401b bombs, four 201b Cooper bombs or four practice bombs. Target-towing gear consisted of a B Mk.IIA wind mill-driven cable drum attached to the starboard fuselage adjacent to the rear cockpit. Two 3ft-diameter sleeve targets or three 5ft 5in flag targets could be towed. On February 9,1937, the B-24 prototype, K5178, flew for the first time in the hands of Blackburn chief test pilot Capt KM. "Dasher" Blake. In November Blackburn delivered K5178, since August officially named Skua, to the Aeroplane and Armament Experimental Establishment (A&AEE) at Martlesharn Heath. Handling trials were favourable. The cockpit layout and forward view drew praise, and handlingwas generally acceptable, but the aircraft tended to nose-up into a stall if the controls were released, and stability about all axes was poor below 140kt. The stall was not vicious, but could lead to a wing-drop and spin if uncorrected. Terminal-velocity tests assessed the Skua's suitability for dive-bombing. It was put into a vertical dive from 20,000 ft until drag equalled the downward acceleration of the machine. It quickly became apparent that the Rua would make an effective and accurate dive bomber. As it would be operating from aircraft carriers, good control at low speeds was essential. Much effort went into eradicating the low-speed longitudinal and lateral stability problems. In 1937 K5178 was given upturned wingtips to improve lateral stability. These could be easily incorporated on production aircraft. Delays in design and construction now began to cause problems. From December 1937 the RAE tested K5178 with various spoilers and leading-edge fairings to al low the inner wing to stall before the outer, to warn the pilot before the wing dropped. They made the stall more gradual and predictable, but also raised the stalling speed too much for carrier landings, so were discarded. The RAE then recommended giving the tailplane longer, more rounded tips to extend beyond the propeller-wash and increase stability. It also proposed leading-edge slats, which were tested on the second prototype, K5179. These were ineffective, so an "interim" anti-spin parachute, released by an external cord from the cockpit to the tail, became a production feature. To cure the self-stall the nose was lengthened 2ft 4.75in on K5179 by extending the engine mounting. Like the upturned wingtips and wider tailplane, this was adopted for production Skuas. Thus many of the negative characteristics had been cured or reduced. Even so, aerobatics were prohibited below 5,000ft. The first production Skuas were delivered in May 1938, and joined the testing programme. However, in June 1938 the Air Ministry recommended cancelling the programme because the aircraft was approaching obsolescence as a fighter. The Admiralty resisted, as there would be no fighter to replace it until the middle of 1940, and no new dive bomber for the foreseeable future. The programme continued, though delivery of the 190 airframes was not completed until March 1940. Production Skua L2870 was used for deck-landing trials, and L2867 went to the RAE to clear the type for `accelerator" (catapult) use, target-towing and to test the radio equipment. The assessment of the catapult trials noted: "No criticisms. In fact, this aircraft is the first one which was designed around the catapult spools and not the spools attached to the aircraft afterwards." Thus cleared, L2867 joined HMS Courageous for catapult tests at sea. In January 1939 K5178 went to HMS Pegasus for ditching trials. But the process of turning the Skua into an effective fighting tool was only just beginning. Much of the work to unlock its potential would be done by FAA the squadrons themselves.